All parents want what’s best for their baby, and Bamboo Nature Eco Nappies want to help parents do that while also taking care of the environment. They produce nappies and training pants in nine different size, to fit all ages from when they’re born until they’re toilet trained. Their nappies are made in a place where 95% of waste created during production is recycled, and they have a biodegradable core, meaning they’re twice as biodegradable than most nappies! They have lower eco-footprint and fully recycleable packaging meaning less goes to landfills. Additionally they have the Nordic Swan Eco Label and FSC certification. 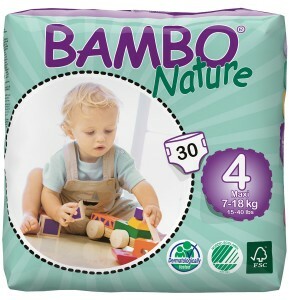 Now how do Bamboo Nature nappies actually help your baby? Theres many features to these nappies that both you and your baby will appreciate! These nappies are very absorbant to reduce the risk of any leaks. They’ve been dermatologically tested so they’ll feel comfortable and soft against your baby’s skin and protect against irritation or rashes. They’re also free from harsh chemicals, and artificial perfumes. The good fit and design will also give baby more freedom to move naturally. The packs also vary in size, as we know how many nappies your baby can go through! Size of packs vary depending on size of nappy, and we also stock handy Jumbo Packs. They also do a pack of 80 fragrance free baby wipes, and we all know how useful they are and how quickly they get used up! Still unsure if Bamboo Nature nappies are the best for your baby? Why not give it a test first before buying a huge pack? You can buy a sample of two nappies for just £1.80 and see for yourself! Do you buy these for your baby? What do you think of them? World Environment Day – what’s it all about?